Motor vehicle crashes are the number one cause of death among children ages 1 to 19? 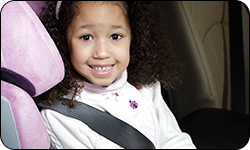 Children ages 2 to 5 who use safety belts prematurely are four times more likely to suffer a serious head injury in a crash than those in child safety seats or booster seats? Of those children ages 12 and under who died in vehicle crashes in 2011, 33 percent were unrestrained? Children should ride in the back seat until they are at least 13 years old? As an educator, you can teach children to be safe in and around cars by using the resources at the Safe Kids Worldwide Educator Portal. There you will find educational materials that can be utilized in the classroom, such as activity sheets, lesson plans and car safety fact sheets.